Primers are designed to prepare the roof surface for accepting a coating and to improve the overall adhesion of the coating to the roof substrate. Typically, they exhibit low viscosity and are formulated to quickly wet the substrate in a thin layer and, when cured, to leave behind a thin film acceptable for receiving a coating. Primers are available in a variety of binder and solvent combinations, and the type of primer used in a particular application depends on the substrate, weather conditions, and the type of coating to be applied. Managers should not decide whether to use a primer without consulting the coating manufacturer’s requirements for the specific coating and substrate. Surfaces that generally require a primer include: metal flashings, gravel stops, and other metal edging; concrete and masonry roof decks; masonry walls and floors; and gypsum and other porous surfaces. Certain roofing substrates also require priming to promote coating adhesion and to prevent the substrate from impairing the performance of the coating. For example, rust inhibitive primers can help prevent flashing rust from blooming through the surface of a water-base coating, and bleed-blocking primers are used to prevent the lighter fractions of some bitumen roofs from staining white elastomeric coatings. Primers generally are applied to clean dry surfaces, but water-based — asphalt — primers in some cases can be applied to damp — not wet — surfaces. Workers should reference the coating manufacturer’s requirements to determine if this application method is acceptable. They also should apply the roof coating soon after applying the primer and allowing it to cure in order to ensure the desired results. 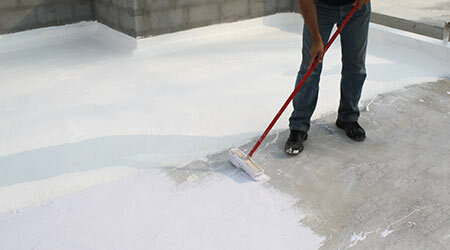 Once managers have specified the proper roof coating and workers have prepared the surface, application can begin. With climate and temperatures varying all over the country, workers need to take different steps when applying a roof coating, depending on the varying weather conditions. In an effort to accommodate the temperature range associated with certain geographic climates, some manufacturers offer so-called all-temperature products, while others offer products formulated for seasonal use. Managers should check with the supplier or manufacturer to determine which versions of roof coatings they offer and to assist with product selection. If the manufacturer offers various viscosity grades, be certain to inquire as to differences in one grades, which might involve specific container markings or labels, and to determine the appropriate limitations on their use. Storage. Always keep the coating stored according to the manufacturer’s published data sheets. A temperature-controlled space capable of storing materials like roof coatings is generally preferred. If storing the coating outside, store the containers per manufacturer’s guidelines, ensuring that the materials are not stored outside conditions listed as acceptable boundaries by the manufacturer. Heating. With proper storage, heating should not be necessary. But on the job site, workers might use heated storage cabinets or warming devices that use circulating oil to heat cold applied roofing materials in order to obtain an acceptable application viscosity. Consult the equipment manufacturer for specific information on the safety and operation requirements pertaining to the heating equipment used. Surface preparation. Never apply roof coatings to a surface with frost, snow or ice. In addition, for most solvent-based roof coatings, the surface must be dry unless the coating has been specifically formulated for adhesion to wet surfaces. It is always best to consult the manufacturer for specific recommendations and requirements, particularly related to cold-weather application. Cure time. While modern technology permits the application of some roof coatings at low temperatures, workers can expect coating cure times in these conditions to be longer than those on a warm, summer day. A product that might cure overnight at a temperature of 70-75 degrees might take several days to cure at 40 degrees. Water-based coatings — emulsions — require temperature conditions that permit complete evaporation of the water before the film can be subjected to freezing or moisture, including rain, heavy dew, snow, and frost. While some modified, water-based coatings have shorter set and cure times, it is important to consider their limitations and to review the application conditions with the manufacturer prior to use. When applying roof coatings in cold weather, managers need to consider the application and curing times from manufacturers coatings and predicted weather forecast. Remember when coating a black roof, the surface will absorb infrared heat from the sun, making the roof temperature warmer than the air temperature and helping to improve the overall cure rate. Manufacturers might specify special limitations for particular roof coatings, such as emulsions and asphalt aluminum coatings. These limitations might include details regarding minimum temperatures allowed, as well as exposure to moisture within a certain time period following the application. Workers should follow specific instructions from the manufacturer. This special report was provided by the Roof Coatings Manufacturers Association, roofcoatings.org.